Everybody already knew that ancient powers did not have the possibility of growing stronger. They were things that only had one level. That was why they knew that Cale had no reason to train. That was also why they understood how Cale must have felt while sitting on the bench and watching them train. Raon's really cute on this fanart!!! 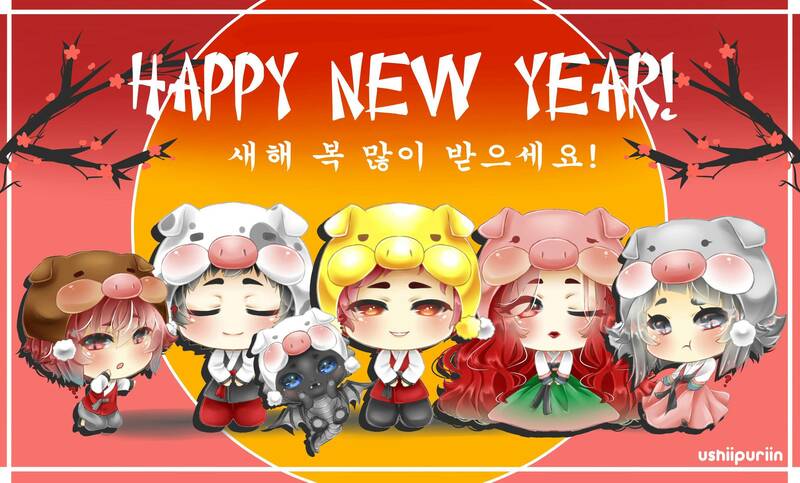 awww happy chinese lunar new year too! So cale is the one in the middle, choi han on the left, rosalin on the right, I'm assuming the wolf boy farthest left. Who's the little girl? Or are the little ones On and Hong? Blitz and Elkon like this. You had your scamming smile when you said that you would heal her, so I thought that you were lying. Human, you really are a good person. You are weird sometimes, but your foundation is good. He has too easy battles. He should have ones that will make him struggle a bit so that he'd have enough 'EXP'. hmm maybe it's because if he grows bigger he couldn't rest on Cale's shoulder anymore? I'm sure there's a logical explanation... that the author made up after he realized what his readers would do to him if cute little Raon grew to the size of a horse. Raon grew to the size of a horse. maybe Raon would learn a shapeshifting magic when that happens? Shield Loyalist and Daily Prog like this. Awww... Cale trying to comfort Raon is adorable. Haha...I hope you will not regret your decision of being Cale's guard, Eruhaben-nim. Cale fakin his death, going on holiday, and come back hailed as the "demon king", leader of the "apocalypse demons" who destroyed half of the world. Raneday, Shield Loyalist, Daily Prog and 1 other person like this.